The winners of the 3 Minute Ph.D. Competition were announced last night in an awards ceremony at Bar Fiasco. First prize went to Samuel Schmid, a fourth-year researcher in the SPS Department, for his video on citizenship and immigration policy. Samuel won financial support for an article to be published through Open Access. Leon Dijkman, a first-year Law researcher, came in second place for his video on patent law and exclusive rights, while third place went to Ines Bolanos Somoano, a first-year researcher in the SPS department, for her video on the EU’s counter-terrorism policy. Both won book vouchers to support their further research. The competitors had each created a two to three minute video explaining their Ph.D. research for a generalist audience. 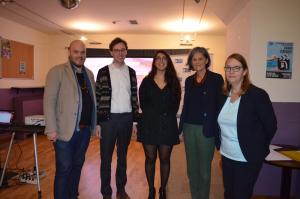 The judges praised each of the contestants for their creative approaches to the task, their understanding of their field, and their accessible and clear explanations of complex critical subjects. Many thanks to all those who entered, and well done to the winners. If you are a researcher interested in entering the competition for next year, the details for entry can be found on the 3 Minute Ph.D. website. You can also watch all of the winning entries on EUI’s YouTube channel.